Actor Nikhil who has struck a chord with the audience by bring good back to back movies like Swamy Ra Ra and Karthikeya, is getting ready to score a hatrick with Surya Vs Surya. As reported earlier, movie is getting readied for a release on March 5th. Today the censor formalities of Surya Vs Surya are completed and the movie is awarded with clean ‘U’ certificate which is very rare these days. Nikhil is playing the role of Surya who suffers from a disease which prevents him to go out in the sun. Tridha Choudhury is the female lead in this movie. Actress Madhu Bala is playing the mother role to Nikhil. Newcomer Karthik Ghattamaneni is the director. 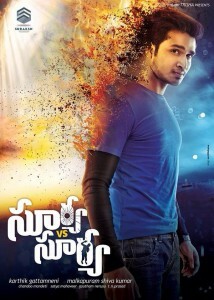 Hope Nikhil scores hatrick with this movie.